When I first started homeschooling, I didn’t even think about high school years. We started so suddenly that I was just trying to figure out our day to day! Now that we have been homeschooling for five years and Ryan is more than half way through high school, I feel like we are doing ok! Sometimes you see articles talking about the scariness of homeschooling high school and it might throw you off your game…thankfully that didn’t happen…very often, lol. In working with The Old Schoolhouse doing reviews and such, they have allowed me to give away three things from their Schoolhouse Store. Did you read that? I said GIVE AWAY. So, of course my first thought was to check out their high school stuff. Because that can be scary, y’all!! I think even more scary than homeschooling the young kiddos.. Of course, that’s because Lauren was in 3rd grade when we first started homeschooling, but still..ha! If you are homeschooling high school or are going to soon, you don’t want to miss out on these free items!! The first item is this Homeschooling Through High School Bundle. Just looking at the description you can tell it is full of helpful information and insight from people that have gone before you with homeschooling these ages. This retails for $24.90 and would be worth purchasing at any time! Make sure you click on the link to see what all is included in this bundle! 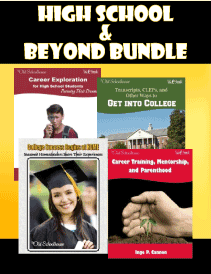 Next is this High School & Beyond Bundle. This is fantastic for helping them figure out careers, college, and that sort of thing. If you are like me and have kids that just aren’t sure what they want to do when they grow up this is perfect! This retails for $18.30 and is full of excellent information! 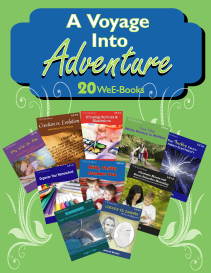 A Voyage Into Adventure is a collection of 20 e-books. This doesn’t really have anything to do with high school, but I included it because it pretty much has something for everyone. 🙂 So, if you have little kids and don’t even have high school anywhere in your sights right now, make sure you check these out! This one retails for $39.00. Now, before I give you the code to get these wonderful products, maybe take a few minutes and check out and like the The Old Schoolhouse Homeschool Facebook Page! If you already aren’t a part of it, they let you know how to get the first month of SchoolhouseTeachers.com for only $1. I reviewed them a few months back..love all of the classes on there! The Facebook page has a few fun things on there too as well as all of the reviews that the crew does. Sometimes I don’t review certain things because they fall out of my kids age group or something, so you don’t want to miss checking out things that you may not have heard of before. That’s one way that I pick out new curriculum in our family! Awesome! Thanks, Jenn. I’ll check it out. I looked at The Old Schoolhouse’s site a few months ago and they did a great job updating it, so I’m excited to look into it some more. Thanks. We don’t have a high schooler yet but she isn’t far away. These will be great to hang onto and read. Also, I love the WeEbooks! Thank you.